Etan's interest in real estate was inspired by his family members who have sold victorian homes in Ditmas Park, Brooklyn, as well as owned properties all over the world. With almost five years in the hospitality industry, Etan makes the extra effort to be available to his clients at all times. His skills include sales, advertising and extensive research as well as building client relations that last. Etan is driven to helping you find your dream home while ensuring a comfortable process. 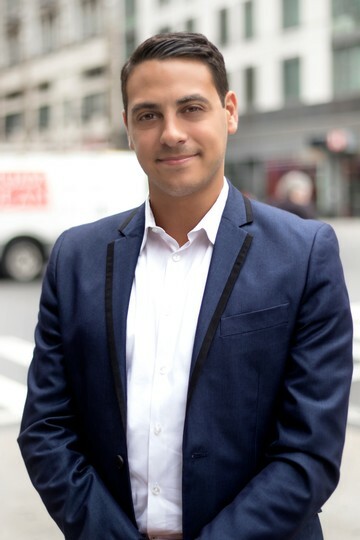 He graduated from Brooklyn College with a Bachelor's and once he began his journey into the real estate industry, he was immediately immersed in all that it had to offer. Etan was born, raised, and is currently residing in Brooklyn, which gives him an advantage when showing apartments since he is familiar with the city area. He has traveled the world extensively and his interests include making music, cooking and traveling. 3 BR at CLINTON ST.
February 2019 by Deryn S.
Etan was incredibly flexible, friendly, and easy to work with. He was so knowledgable about the space, and the legalities of being a broker. Even though the spaces he showed us were not the right fit for my boyfriend and I, we still loved working with him! February 2019 by Lauren R.
Highly recommend! Loved working with Etan, Thomas, and Charles during this process of finding our next apartment in the city. Etan helped us find our ideal apartment and was extremely responsive to our every question during the application. Best experience by far during my several years in the city and moving apartments! February 2019 by Evgeniia E.
I cannot say enough about how wonderful it was to work with Etan. He is a great professional. I highly recommend him! January 2019 by Lea K.
We had a great experience with Etan from REAL New York. He was super responsive and easy to work with, from when I sent him my initial request to see the apartment until the end. We ended up going with a different apartment, but we were glad to have met and worked with Etan and would 100% recommend him to others searching for apartments in NYC! December 2018 by Jacob B.
Anne and Etan were extremely helpful and sweet! They got me into an incredible apartment and the process was totally painless. These guys are good news! My agent Etan Zango was amazing throughout the process of finding my current apartment. He was very professional and always quick to respond on any questions I had. This was by far the best experience I''ve had working with a real estate agent in NYC. Would highly recommend working with him. Let me tell you, this gentleman is beyond professional in his business. Probably one the best real estate agent I''ve met. Very professional and hardworking individual who really went above and beyond to help me out with an apartment. Really happy doing business with this person. Thumbs up. November 2018 by Michelle Z.
Etan Zango helped me find an apartment to rent in the west village. I highly recommend him! He is a very nice guy and a pleasure to work with. I am impressed with the amount of care and devotion he has shown as my broker. For example when I asked for measurements he went and measured the dimensions himself. Sometimes he even asks me how the apartment is going.. after I already moved in! Etan always responded quickly to questions, and kept me updated throughout the process. Thanks to Etan I got the apartment I wanted!! October 2018 by Ruthie S.
Greatest agency in New York. Etan Zango is by far the best broker I have ever worked with or met for that matter. I would give him 10 stars if I could. He was unbelievably kind, informative, reliable, supportive and patient throughout the entire process. My roommates and I are new to NYC and to apartment hunting, so landing a place was understandably complicated. Etan vouched for us when he barely knew us and went out of his way to get everything settled. He made the whole experience an absolute blast and made us all feel very comfortable and secure. He is a one of a kind broker, an extraordinary monarch of real estate, a true superstar.